Published in the South Kent Gazette, 14 November, 1979. This land in Biggin Street would appear to have been on the north-east side of the upper part of the street, and the owners of adjoining lands were Thomas Godespeny and Richard Archer, indicating that that part of the street was not then built upon. Another deed, made on the 12th September, 1392, conveys a 2/- a year ground rent to Thomas Crouch, arising from “a plot of land in Biggin Ward.“ This land, too, was in the upper part of Biggin Street, on the west side, with the lands of John Mason below it and the lands of John at Mill above it. All these lands appear to have been, at that time, void. The only other deeds referring to Biggin Street are two — the one already mentioned, by which the Corporation leased part of New Street to Thomas Challice in 1566; and the other, dated 20th July, 1540, let the same waste land to John Elam. The remaining part of ancient Biggin Street to be noticed is the Maison Dieu, or, to adopt the style of ancient times, the Domus Dei, for the great establishment at the head of Biggin Street was always referred to under the Latin name until after the dissolution of the confraternity of Master and Brethren by Henry VIII, after which it was referred to as the Maison Dieu. The description and history of the Domus Dei through its many vicissitudes will be separately treated. Mediaeval and later times afford many interesting bits of Biggin Street information. Reverting to the forge at its entrance, Thomas Challice and his forge flourished at the side of Biggin Gate for 47 years, and, dying in the year 1613, he made two bequests: one was an annuity of ten shillings per year for St. Mary's poor, payable out of the house which was known as the "Saracen’s Head", at the New Street corner; and his other bequest was a house which he left to the poor; but both the house and annuity have been lost. The "Saracen’s Head" was for many years a well-known Biggin Street feature. It was a very old licensed house, but in the early 1870s it was converted into a coffee tavern, and so remained until the street widening scheme demolished it. A glance at that substantial brick frontage of the building in our 1894 picture adjoining St. Mary’s churchyard suggests that the building on both sides of the arch comprised one establishment. Soon after Biggin Gate was taken down, these premises were built and used as the residence of Mr. Pinch, the proprietor of the wool factory a few yards eastward, at the place afterwards known as the Union Hall, and the archway was an approach to it. After Mr. Pinch’s day, the part of the premises which was later the "Wellington Hotel" — with a bowling green approached through the archway — was the residence of Mr. E. G. Rutley, a well-known Dover surgeon; whole on the other side of the arch was a shop and library. The building was demolished in recent years to build a supermarket. Where Pencester Road now is, stood Gunman’s mansion, which, it is believed, had existed since the Commonwealth time. The story of the Gunmans, their ancestors, and successors, is worth telling. The line began, as far as we know, with Captain William Stokes, R.N., a freeman of Dover, who, during the Commonwealth, was a Commander in the Fleet, and he was one of the captains of warships in the Downs whom Sir Edward Montague undertook to induce to transfer their allegiance from the Commonwealth to the King. Stokes was difficult to deal with, for Mr. Pepys, in his Diary, wrote, “My Lord said he did not like Captain Stokes.“ The captain, however, had his weather-eye open, and seeing how the political wind was blowing, made no vain resistance, neither did he parade any exuberant Royalistic feeling. He simply stuck to his post and he commanded one of the ships that escorted Charles II to Dover. Stokes did not take part in the scramble for honours and emoluments after the Restoration, but seemed to be content with his local good standing, which secured his election once as Member of Parliament for Dover, and seven times as Mayor. Whether Captain Stokes dwelt in the Biggin Street mansion is not recorded, but it is probable. He had a daughter Elizabeth, who married Edward Wivell, and according to the customal of Dover, that marriage made Wivell a freeman; and, becoming a member of the Corporation, he was six times Mayor. His wife died before him, and his opponents contended that, having obtained the freedom through marriage, he was no longer a freeman after his wife’s death; but on the objection being brought to an issuer it was held that he was entitled to retain his position. It is uncertain whether Edward Wivell resided at the Biggin Street mansion, but he was a man of importance, and the owner of the manor of Buckland. He had a daughter, also named Elizabeth, who married Captain James Gunman, and brought to him the Buckland manor. James was the first of the Gunmans that we hear of in Dover, and he had a younger brother, Christopher, of whom more anon. The first we learn of Captain James Gunman is from an entry in Mr. Isaac Minet’s diary, which states that Captain James Gunman was one of the bearers at the funeral of Mr. Henry Matson in 1722; and it is further noted in the same book that Madame Elizabeth Gunman, nee Wivell, was one of the bearers at the funeral of Mrs Minet in 1738. All the bearers on that occasion were ladies, which is an interesting illustration of the custom of those days. We first hear of Captain James Gunman in a public capacity in the year 1737, when he was Mayor; and again in 1745, when he was one of the Committee of Defence then appointed, owing to the fear of the town being seized by the French. At that time Captain James Gunman seems to have been a man of importance, he being named in the committee of eleven next to the Mayor. He only appears to have been Mayor one year, and died before his brother Christopher, to whom he bequeathed his estate, including the manor of Buckland. Christopher Gunman was three times Mayor — in the years 1751, 1760, and 1773. Little is left on record respecting Christopher, except a tradition that he was marvellously rich, it being the talk of the town that Madame Christopher Gunman could have curled her hair with banknotes if she liked. An artist’s water colour impression of the scene at Dover on May 29, 1660, when King Charles II arrived in England upon the restoration of the Monarchy. 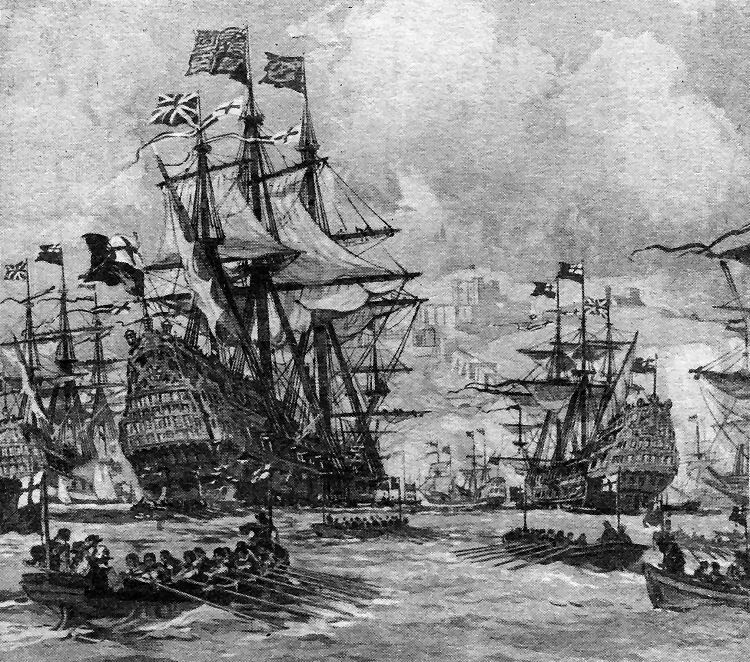 Pictured left in this painting by S. Rowles, is the vessel Royal Charles flying the Royal Standard.